In The Feminine Touch, Rosalind Russell plays a character with a lower IQ than her usual character. Although she is a great actress and I think she can do anything she puts her mind to, I find it difficult to believe she could ever really be this dense. Roz simply belongs in smart, witty roles. She was intelligent and funny as hell in real life and so she really sparkles in similar roles. However, in spite of this dumb character (not to mention the smart Kay Francis character that I am almost jealous of because Roz wasn’t her), it is a very funny movie. If you like the silly, the sometimes ridiculous, or even physical comedy, please do watch it! Rosalind was simply gorgeous in this movie as well. I loved her outfits and hats, even if she was saying things like “Oh, I wouldn’t inhibit you, even if I was sure what that meant” while wearing them. She exhibits physical comedy here and there and it is enjoyable just for that. She gets great support from her co-stars Don Ameche, Kay Francis and Van Heflin. It was directed by W. S. “Woody” Van Dyke, who also directed four of The Thin Man movies. John Hathaway (Don Ameche) is an intelligent professor at Digby College, a college that is full of goof-offs much more interested in football than in academics. This, naturally, infuriates him so he enjoys making jokes about his students’ lack of smarts and their beards. All of them have beards (it’s a mens’ college) because if their football team doesn’t beat the rival team at Laurel College, they will not shave. There is one stupid student in particular named “Rubber Legs” Ryan (Gordon Jones, the same actor who plays “Wreck” in My Sister Eileen the very next year) that John likes to pick on. John catches him carving his wife Julie’s initials in his desk surrounded by a heart. He obviously has a crush on Julie and John has no problem with this. When Julie arrives home, John is already home, clacking away at the typewriter. He has been working on a book for many months now called Jealousy and All Its Aspects and Universal Applications, a title that Julie always gets wrong, even though she is married to the author. They are happy to see each other again, but it doesn’t take long before conflict arises. John doesn’t believe jealousy exists in happy marriages, including his own. However, from Julie’s perspective, she feels he should be jealous and is not flattered when he isn’t. This comes out when he mentions that Rubber Legs is smitten with Julie, but he didn’t do anything to Rubber Legs out of anger. He does not feel a bit jealous and Julie is insulted. She pretends that she had been dancing every night back home (visiting her mother) and keeps bringing up the name of Bob Jordan, the man she was engaged to before she met John. Of course, John has no recollection of Bob Jordan, which irritates her. She tells him that Bob is jealous of John and would kill him if he met him. She yells out, “He’s jealous because he loves me!” Bob replies, “The one has nothing to do with the other. If you go back far enough, you’ll see we all lived in trees and threw coconuts at each other” and there is no need to go back to those times. This infuriates her and tells him she wants to beat him and throw coconuts at him. She tries to hit him, but hilariously misses as she sinks to the floor awkwardly. This is just a taste of the physical comedy I mentioned earlier, something I think Rosalind was quite adept at. John has hopes of publishing his book and has his draft ready to show to the publishing houses. As they have breakfast, ready to tackle the Elliott Morgan Publishing House, it is obvious that while John has book smarts, he doesn’t have street smarts or common sense. For example, Julie always has to tell him when he should drink his coffee because if she doesn’t, he’ll burn his mouth every time. Every. Single. Time. At the Elliott Morgan Publishing House, we first meet Nellie Woods (Kay Francis), a no-nonsense, tell-‘em-like-it-is, very smart woman who works there. It isn’t long before the audience gathers that she runs the entire company and Elliott doesn’t do much of anything. 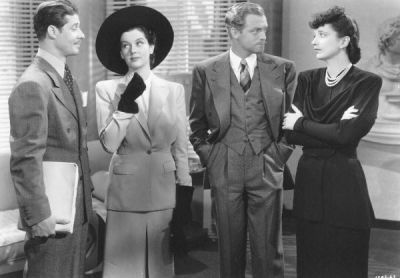 Something I always giggle at is the fact that Kay Francis stands a bit taller than Rosalind does. It is not common to see another actress in a film taller than Roz and I love it! Julie doesn’t have a very high opinion of Nellie when she first meets her. She feels insecure about her own intelligence compared to Nellie’s and seems jealous that Nellie will be talking to her husband alone. After they go into her office, we meet the infamous Elliott Morgan (Van Heflin), who has been locked into his office by Nellie. He persuades Julie, who is the only one in the waiting room, to let him out and she does. As soon as she sees Julie, he is quite taken with her. He is very neurotic, always complaining of having psychological ailments. When the four of them are in the same room again, they talk about going outside and Elliott says, “I’m allergic to grass.” And Nellie replies, “And fresh air… and me.” Julie can tell Nellie is in love with Elliott, in spite of his lack of attention to her. But they already fight like married people. He takes Julie to the dance floor right away after feeling she is fascinated by him and wants them to be together. Meanwhile, Elliott tells John that he is very attracted to Julie and has this compulsion to take wives away from their husbands. John is nonchalant about it and tells Elliott that he should pursue Julie because he knows that Julie would never be attracted to him. Elliott sports a beard and Julie hates beards. So Elliott does just that—he gets Julie alone and starts a conversation with her. She, however, is very distracted by seeing Nellie and her husband together. She describes herself as “not very clever and sort of ‘unmental,’” which is still something I can’t wrap my brain around because it’s Rosalind Russell! But no matter. The four of them go to a nightclub afterwards and while John and Elliott seem contented as the singer sings a song called “Jealous,” Nellie glares at Elliott and Julie frowns, finding Nellie to have too much in common with John. The lyrics reflect exactly what the ladies are feeling. Nellie and John start spending a lot of days together working on the book. Meanwhile, Elliott takes Julie to all the important places in New York City. He hopes to eventually seduce her, but she has no interest in him whatsoever. “Julie, you’re inhibiting me,” Elliott tells her on the top of the Statue of Liberty. Even though she doesn’t know what that means, she’s sure she wouldn’t do it. When Julie comes home, she is shocked to find John drinking champagne with Nellie, his arm around her. Nellie looks just as shocked as Julie does, but John is ecstatic, not realizing he’s done anything wrong. He knows who he is in love with and he bears no jealousy and doesn’t think Julie should either. After Nellie leaves the room, Julie makes John sit next to her and put his arm around her. “Two people in love?” she asks John. “If ever there were two!” he says. She furrows her brow and lowers her voice, saying, “And what would you think if you found Elliott and I in this position?” “Not what you’re thinking,” he replies. She angrily retorts, “Why not?” He is very calm and collected about it. She informs him she does not want to be rational. “That’s right. You want to throw coconuts,” he says. She starts to cry (kind of reminds me of the way Lucy cries in I Love Lucy) and yells out: “It always winds up like this, with me feeling like a rat!” “I don’t want you feeling like a rat,” says John. Julie responds, “But I am a rat!” They make up, but she still isn’t sure she can act the way John does. The next day, John introduces Julie to the infamous New York City subway. After all, Julie comes from a “hick town” and doesn’t know anything about it. He calls the people rushing back and forth the “subway dwellers” and even spots what he calls a “subway snake,” a masher who bothers women, using the line with a thick New York accent, “Say, ain’t I seen you somewheres before?” He tells Julie that if it happens to her, she should just look at him and say, “Lay off, bub, or I’ll call the cop!” Even though she is sure she would pop him one, he says this is the way to go. On the subway, they have a few laughs by repeating the subway masher scene to each other, but unfortunately, there is a cop on the subway and he ends up dragging John away, even as they both try to explain they are married. Julie immediately goes over to Elliott’s place to get some help. He had been expecting her that evening anyway because he had hinted to her that he wanted her to come. She just wants help in getting John out of jail and nothing else. In order to get her to stay, he pretends to call up Freddie Bond for his aid. Nellie, knowing that Julie is at Elliott’s apartment, calls all of her friends and tells them to come over to Elliott’s right away. It’s a “come as you are” party, so it isn’t long before people start invading Elliott’s apartment, dressed in their pajamas or party clothes if they had been out all night. When Julie sees Freddie come in, drunk as usual, she figures out that Elliott never called him at all. So she leaves in a huff. Meanwhile, on the island, Elliott wants nothing to do with Julie because he had made up with Nellie the night before and decided they would marry soon. Nellie comes over to the Hathaways’ apartment that day, all sunshine and flowers, happily humming because Elliott said he needed her. When a telegram is delivered, she reads it and all happiness is sucked out of her. Julie has gone to Elliott’s island and Nellie thinks she and John should go there right away before something happens. As usual, John thinks there’s nothing to worry about, feeling no jealousy at all. Julie arrives at Elliott’s cabin during a storm and lets herself in. She goes into the bathroom without him knowing she’s there. When she starts humming “Jealousy,” he thinks it’s the radio and tries to turn it off. He sees that doesn’t work and realizes someone is in his bathroom. He is furious that she is there and wants her to leave, but she refuses. When the lights go out due to the storm, Julie tries to light a lantern, but it catches fire and singes Elliott’s face. He is now irate and locks himself in his bedroom. John and Nellie arrive the next morning and Julie is ecstatic to see him. But when he says that her being there is “not important,” she has had it. John lets Elliott know he doesn’t want him to publish his book and tells Julie they are going. She refuses to go with him, so he grabs her arm and literally drags her outside. When they get to the lake at the end of the property, he accidentally falls in and ends up with a bad cold the next day. Julie tells him that she’s leaving him as he lies in bed, sick as a dog. She thinks they don’t belong together. “I can’t think all the time. Your love is something I don’t understand. It’s got too many syllables for me… or something.” Like she had said earlier, her love “can’t even read.” Before she leaves, she instructs him on how to tell when his coffee is okay to drink. John is very sad to see her go, but he becomes angry when Elliott strolls in, clean shaven. Knowing that Julie could go for him without a beard, he wants to beat him up, his jealousy finally surfacing. A very silly sequence follows as John chases Elliott around and around a tree outside. Unfortunately, John, in his bare feet, keeps stepping on pine cones and hopping up and down in pain. They get into a fistfight, punching each other’s fists in the process. Eventually, they end up both passed out. As each woman rushes to her man, they insult the other man until both ladies get angry. Then it’s their turn to fight, pushing each other, slapping each other, and pulling each other’s hair. The poor boat captain gets in the middle of it… literally! It ends with the foursome walking out of a building. A man yells out to Julie, “Hello, sugar!” so John, finally letting himself be jealous, runs back after him, intending to punch him. He comes back with a black eye of his own. What a bad fighter he is! Julie smiles with glee and kisses him on the cheek. All is well as long as everyone is jealous! When I think of the action/adventure/romantic film They Met in Bombay, besides the beautiful Adrian costumes that Rosalind Russell wears, I think of a story that occurred during the shooting. One morning while driving to work, Roz, who thought she was a most competent driver but really wasn’t, once again got herself into trouble for reckless driving. This time, she was taking her usual route, but drove smack into a tree. While most of the damage was sustained by her car, Roz left the scene with big, fat lip. She still had to film that day, so they filmed wide shots of the scene where her character Anya runs from her car up to the gate to talk to Clark Gable’s Gerald Meldrick. Every time I see that scene, I think… I wonder if any of these shots include her fat lip… from a distance? And I have come across more than one newspaper snippet involving Roz in an accident for her crazy driving. It’s just who Roz was and we love her for it anyway. They Met in Bombay, although chock full of cute romantic kisses that make me go all jelly inside and full of absolutely stunning Adrian gowns, is certainly not one of my favorites. This is partly due to my distaste for action/adventure films. I have never been a fan of them and for me to really love them, they have to be damn good. We all have different tastes and my tastes tend to favor comedies, sometimes tearjerkers, sometimes musicals, but action films and westerns are not my thing. So for these reasons, I prefer the first half of the film to the second half. Clark Gable plays a jewel thief named Gerald Meldrick. For his next great caper, he plans to steal the coveted Star of Asia, which is owned by the Duchess of Beltravers. She plans on attending the ball being held in Bombay in order to make his plan happen. When he arrives at the hotel, he poses as a detective in charge of taking care of the Duchess’s jewels, even handing management a letter confirming it. They decide to trust him and he eyes the safe where the jewels are kept. In the lobby, he gazes upon a beautiful woman strolling to the front desk, her head held high as if she knows exactly what she wants. He wants to meet her and get to know her. Her name is Anya von Duren (Rosalind Russell). She is said to be a baroness, but it is revealed to the audience she is a fake because she is reading up on the Duchess and the other royal family members so it looks like she knows her stuff. When two men of the hotel staff help her pick out a table for the ball, it is very funny. The next day, Gerald wants to quickly get a shave in the hotel barbershop, which is right next to the “ladies’ salon,” only separated by a paper partition that can be taken down. At first, he wants to be out of there as quickly as possible, but then he spots Anya right across from him in the “salon.” He smiles wide and decides to get the works—shampoo, manicure, pedicure—just so he can stare at her. Anya is not pleased to be stared at and is frustrated when the partition falls down and can’t be put back up. Later, when she strolls over to the elevator, he notices her, having waited for her. She looks a bit confused and he gets on the elevator with her, offering his services so she can get where she’s going. He slyly bumps into the emergency stop button so they are delayed. She is visibly annoyed and he goes on talking to her, pouring on all the charm he can. Most of his pick-up lines are corny to the extreme and Anya is aware of this. Her eye rolls and general disdain for him are comical. When he mentions that he’s a detective, this peaks her interest. Just as the elevator starts up again, he remarks, “Whenever I look at you, I get the strangest feeling that I’m suddenly shooting up toward heaven.” When she invites him into her room for a drink, she asks him questions about being a detective, feigning innocence and naïveté about crooks and the art of stealing. However, he knows she’s up to something because when she left the room, he notices that she had been reading up on the duchess and her family. That night at the ball, Gerald comes over to Anya’s table, which horrifies her. She doesn’t want him around as she starts up her plan to steal the Duchess’s jewels. She asks him to leave, and then pretends that her “guests” didn’t arrive and acts like she’s embarrassed about it. She passes the duchess’s table, getting a careful look at her. The Duchess of Beltravers (Jessie Ralph) takes a good look at Anya and immediately wants her to sit at the table with her. As they converse, Gerald listens intently to Anya speaking in a very rehearsed manner about the Duchess’s family. Anya, knowing about the Duchess’s history with alcohol, liquors her up and helps her to her hotel room. When the duchess passes out, Anya slowly and carefully slips the Star of Asia off her neck, drops it into top of her own dress, and steals out of the room, turning off the lights. Gerald emerges from one of the Duchess’s rooms, carefully places the fake necklace on the Duchess, and goes after Anya. He demands the necklace when he arrives in her room. She feels she’s been licked and lets him take it. She is surprised, however, when he doesn’t arrest her. He responds, “How can a man put handcuffs on moonlight?” When he walks down the hall, she looks after him, saying pathetically, “Thank you, thank you, thank you!” But just when it looks like Gerald has succeeded, Anya sees two of the hotel staff walk over with the “Star of Asia.” As she looks at the fake necklace, she realizes what Gerald just did to her. That involuntary eyebrow raise occurs! The next morning, Gerald inquires about Anya at the front desk, but is told she already checked out. When he exits the hotel and is about to get into a cab, he sees Anya already sitting inside it, smiling at him. It isn’t long before she lets him know that she knows he’s a thief, too. She demands to have her “property” back (the jewel), but he informs her that he should keep it for being more clever than her. When he calls her an amateur, she snaps, “I’m just as good a thief as you are!” But before they know it, in spite of what Gerald calls his cleverness, the cops are on to them. What follows is a chaotic, rather thrilling car chase, each car swerving back and forth like lunatics. They do escape the authorities and end up in a boat until they see a big ship about to leave. They ask the captain where he is going and he says Hong Kong. Anya is not pleased with having to go to a faraway place like Hong Kong, but she has no choice. They promise to pay him for giving them passage on his ship. Gerald makes up a story about running away with Anya to get married. She is already married, according to him, and they are escaping her husband. At first, she cries out “How dare you!” but she decides to go along with this cover. Anya also squawks about having to share a room with Gerald. After all, she hardly knows him. Gerald tells the captain (played by Peter Lorre in one of those gross caricatures of the typical Asian character of films at the time) that it wouldn’t be appropriate for them to be in the same room, so Gerald gets a small bunk somewhere else. He gives their names as Gibbons and Hobbs and when he gets a chance to talk to Anya, he can see that icy veneer she had about her starting to break. Also, for the first time, she lets her hair down (literally). Rosalind Russell’s gorgeous, dark locks had been up for the majority of the picture up to this point. From here on out, she keeps it down. She has shiny, thick hair that I for one would just die for! After Anya starts to warm up to Gerald, she tells him a bit about her life—how her father was a criminal and she basically followed in his footsteps. Gerald, on the other hand, started doing underhanded things (being a card shark and the like) after a broken heart. Now he’s a champion burglar and he is in good company. The next day, Gerald starts to get suspicious of the captain’s intentions. And for good reason. The captain is in cahoots with Inspector Cressney (played by , he almost caught Anya and Gerald back in Bombay) and plans on handing the two thieves over to him when they dock. Gerald suggests they escape before anything happens and right at this moment, they kiss for the first time. 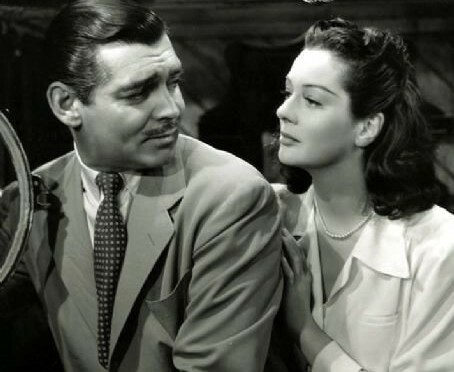 Although Rosalind Russell did not enjoy doing romantic scenes, she did single out Clark Gable. She said something along the lines of “He knew exactly what to do. He knew where to put his feet” and he made his leading lady feel comfortable. Although I can’t imagine Roz and Clark being friends off the set… they just seem so different… I think they have fairly good chemistry in this film, at least in those kisses. They use one of the little emergency boats on ship and climb down into it on the water. Then they row away to freedom. The couple live for a few months together in Hong Kong in a little underground room. Anyone watching this can tell Anya has really started to fall for Gerald and loves the idea of settling down with him and living a normal life. She doesn’t want to hop from town to town anymore and when she hints at this, Gerald doesn’t like it. She gets embarrassed and tells him she just got a little “goofy,” but she is visibly disappointed. They keep the Star of Asia, which they nickname “Baby,” inside a wax candle. Gerald, who has become restless staying in one spot, gets an idea. He takes the identity of Captain Houston, a soldier, and gets a uniform fitted. He plans on using this to get out of Hong Kong. However, when he is spotted in the uniform, he is ordered to support Her Majesty’s Land Forces. All men in uniform are being rounded up. Anya poses as Mrs. Houston and they try to devise a plan to get him out of there. Just as they almost have him out, he is needed to evacuate some Chinese people, but the Japanese who have invaded won’t allow it. What follows is the warfare sequence—with gunfire galore and the derogatory term “Japs” being thrown around, it is not my favorite part. I lose interest at this point also because Roz seems to mysteriously disappear. After the gunfire ends, Gerald is shot in the shoulder and must recuperate in the hospital. Anya visits him every day and fell even more in love with him after seeing him in uniform. She is not as interested in being a criminal anymore. Gerald then receives the Victoria Cross, the highest honor, which Anya arranges. Unfortunately, Gerald does not want to be seen by all those people and to top it all off—to be filmed! Begrudgingly, he attends the ceremony and receives the Cross. He is met by Inspector Cressney and learns that Anya told the inspector that Gerald was posing as Captain Houston. He is angry at this, but as they walk outside, he orders some soldiers passing by to arrest Inspector Cressney on the spot. Later, an angry Cressney is outraged at what happened to him and at the fact that Anya and Gerald slipped through his fingers again. But suddenly, Anya and Gerald show up at his office, handing over the Star of Asia. Anya tells him to book them as “Mr. and Mrs. Meldrick” because they will soon be married. I have never been a fan of this ending because although it is justice for them to be caught in the end, why does Anya act so happy about it? It’s not as if they will spend their life together in jail. But well, reality isn’t always an essential part of 1940s films.